Looking for the perfect gift? 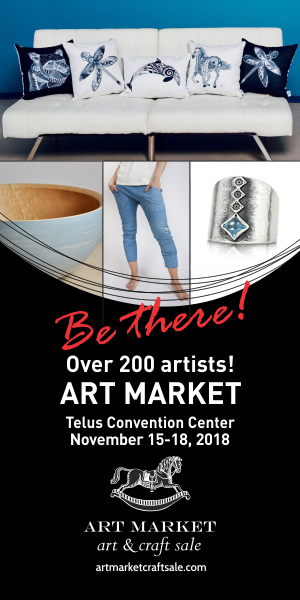 Find something unique for that special someone or yourself at the Art Market Art and Craft Sale from November 15 - 18 in the Telus Convention Centre. 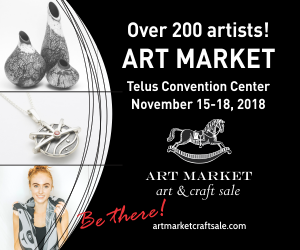 As Calgary's premier art and craft sale, the Art Market will showcase a huge selection of unique pieces from over 200 Canadian artisans! Explore a vast array of delicate pottery, vibrant jewellery, creative clothing, timeless home furnishings and so much more! 2 for 1 evenings Thursday & Friday, as well as live band and cash bar. On Saturday November 17, the Art Market is giving away $100 gift certificates every hour from 11am-4pm to spend at the show! Live band and bar are back on Saturday afternoon at 3pm, enjoy extended hours as well until 7pm. Sunday November 18th, 6 lucky winners will be drawn for our 6 showcase draws worth over $1000 each of artist work! If you buy your tickets before November 14, you'll also be entered to win a $250 gift certificate to spend at the show! Enter below to win a special $500 Artisan Prize Pack that includes a basket filled with a variety of artists work and 4 free passes to the event!